As the leader of a growing eCommerce business, your company’s future hinges on your ability to make the right decisions — from determining whether or not to bring in partners to choosing the best time to add new sales channels for your products. The risks are high, but the payoff for making the right decisions is even bigger. 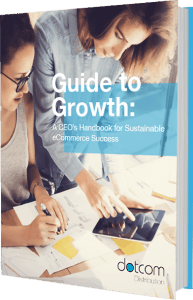 To help growing online retailers make the best possible decisions, we compiled a guide with advice from Dotcom experts as well as Carol’s Daughter founder, Lisa Price, and its CEO Richard Dantas. Ready to take your business to the next level? Complete the form to download your guide to successful eCommerce expansion today.